Paleo Illustrata: Paleo Art or Scientific Illustration? Paleo Art or Scientific Illustration? One of the most interesting issues I've come across in the paleoart blogsphere is the question of whether pictures of dinosaurs are art or science, and whether it's reasonable to illustrate dinosaurs in any way apart from using the latest science. Of course, accessing the latest science has become a bit of a hot topic recently and anyone following the lively and passionate discussions that followed Greg Paul's announcement that he wanted people to stop using his skeletal reconstructions will understand many people hold the subject of paleoart very close to their hearts. But what about the actual function of palaeoart; purely scientific representation or could it be entertainment too? Could it go deeper than simply illustrating past life (not that this is actually a simple task) and illuminate some of the less quantifiable aspects of being a living being on our planet? The image at the top of this post is actually from one of my sketchbooks. I had just acquired a rather natty brush pen and was experimenting with the strokes and assessing the quality of line, opacity of the ink etc. 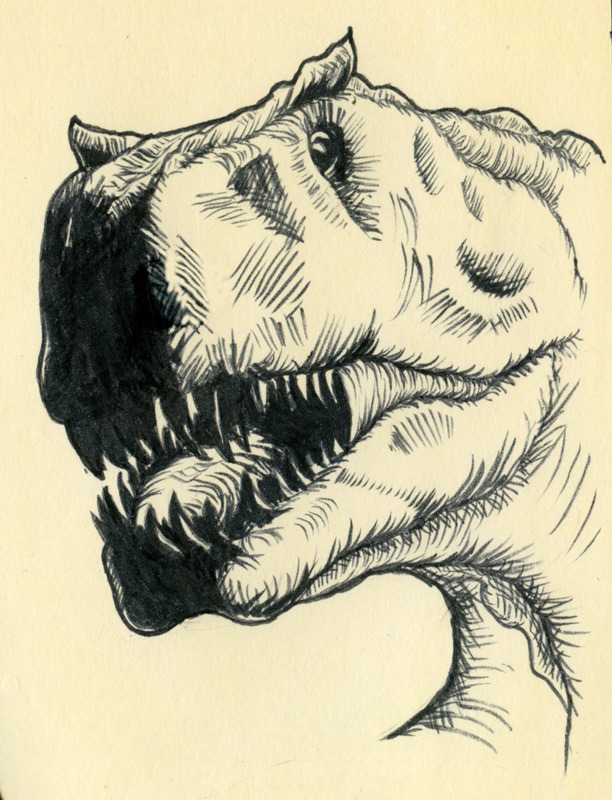 At some point I doodled this comic-book version of a large angry theropod, very loosely based on Tyrannosaurus rex and not ever meant to be seen by anyone. At the time, I was doing some pitch work for the BBC and had created a look I thought might work with and add something to this image. I scanned the sketch in, loaded it up in Photoshop and off I went. This was the result; a sort of deconstructionist take on dinosaur art with a nod to Frank Miller. I quite liked it, stuck it on my work website and got a positive reaction to the image from several people and so it stayed up. However, one thing always did bother me slightly about it - it simply wasn't accurate. It was never really meant to be, but did this matter? After all, I was more after the 'spirit of theropod'* than an actual reconstruction. Hold on a moment - these two points are of course closely related in a sense. I can understand the mythology thing to a degree, perpetuating old myths and tropes (dragging sauropod tails etc) but am not so sure about "do not create false reconstruction"? Even given the vagaries of Google Translate's sometimes eccentric interpretations this seems clear: Do not depict dinosaurs in any way except with complete scientific accuracy. Now, I don't actually disagree with this as for paleoart to be of value it must be done properly. If you're illustration for a paper, journal or media project then you've got to get your hands dirty and do the research and make sure what you're producing is scientifically accurate - a scientific illustration. But . . .
. . . art is not science. It's a creative as well as technical process and regardless of how scientific you want to be all that information and data is going to passed through that wonderful, complex and mysterious organ that is the human brain. When an artist creates a work they're bringing a whole panoply of conscious and subconscious influences to what they put down on paper, model in a computer etc. In the case of technical drawings for papers etc this filter is dialled right back (it has to be - no room for flights of fancy here) but for much of the rest of the time it's on and working flat out, bringing all an artist's experience and philosophy to bear on the subject at hand. Even in paintings and illustrative reconstructions the filter will be hard at work and is in a very real sense creating a mini-mythos that enables the artist to imagine the creatures he's depicting as living, breathing animals. Even if the animal is depicted accurately there is going to be one whole shedload of speculation and supposition in that depiction, any of which could be false. It's fair to argue that so much is unknown we should be daring in our art. 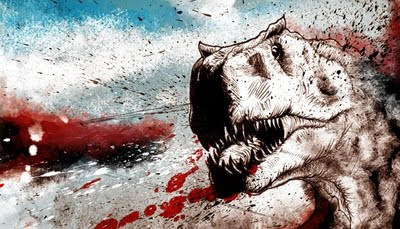 The work of such artists as Luis Rey and Bill Stout could be called mythological as a large amount of the reconstruction is speculative, the execution is stylised yet these images give life to the animals and communicate the work done by palaeontologists in the labs and in the field. These accurate reconstructions but also highly speculative in many ways; they are also powerful examples of good paleoart. So perhaps it's OK, even unavoidable to create a certain mythology when depicting ancient life as living plants and animals. Perhaps my picture does convey something of the savagery of a large carnivorous dinosaur in a feeding frenzy (or perhaps it fails utterly? ), gives some insight into it's inner nature - a subject that will forever be dominated by speculation. I would suggest it would even be desirable in paleoart to have some real left-field artist representations, something more abstract that might communicate the more speculative aspects of ancient life via emotion, intuition and the other influences artist have always brought with them to their work. In some respects, any and all reconstructions could be called false, but perhaps within the field we call paleoart there is place for more than purely scientific interpretation. No art exists in a vacuum, paleoart sits in an uneasy position between science and art and by definition consists of both in terms of technique and philosophy. So should we call it paleo art, or scientific illustration? *I have no firm idea what this is. Sort of the quintessence, the nature, the theropodian id. It is by it's very nature undefinable, but it must have been there as it's there in every other living thing, from protists to blue whales. I keep meaning to bring up Dr. Cau's commandments on ART Evolved. We do not know what any of these organisms truly looked like, and to be honest probably never will (sadly)! To claim that we can and do is very arrogant, and to claim older artists created "false" mythology is condesending. They used the best knowledge of their time to create their pieces. Equally this should hold a key lesson for us. What happened to them WILL happen to us. Science will move on and improve, and refine our understanding of prehistoric animals, and thus render our modern palaeo-art "false reconstructions" portraying prehistoric "mythology" eventually. I think science minded people should be reminded that their field is one of change (hopefully in the direction of progress), and that there are no constants. Which is why the coupling with art is such a perfect match with palaeontology. Neither has any true rules, and only deep time is the limit! If you read my decalogue from a purely artistic point of view, you misunderstand it. When I say "mythology" I mean: unsupported image/idea that the prophane can assume uncritically as a scientific knowledge (for example, the ceratopsids forming a ring around their youngs when attached by predators). Since a false/wrong/obsolete/mythological idea in a paleoart image can spread more rapidly than the correct scientific concepts in a (boring) paper, paleart-mediated mythology is very dangerous for scientific progress. In order to clarify my background, I'm not a mere "science minded people": I'm both a researcher and a paleo-illustrator, so I understand both sides of the paleoart (perhaps, more than a hypothetical "art minded people"). I know there are not "paleontological truths" but alsio knows there are several "paleoartistic lies". Last note: I'm not a "Dr.": my actual degree is like your BS+MSC. I mentioned the perpetuation of some memes and outdated or bad science as being a real problem in paleoart; this is a subject that could probably support a blog in it's own right. I do think anyone attempting any paleoart should do their research and know their subject. Choose a subject carefully and there's plenty of information out there as we all know. Research is important, but so is creativity, and so is imagination. Concerning "mythology" in paleoart, I wonder exactly where the dividing line is drawn in depicting speculation in images; in your example, we may never know if ceratopsids formed defensive rings because so many aspect of behaviour as we can only understand ceratopsid behaviour from the small amount gleaned from the fossil record, and much is this is speculative in nature. So should we exclude all behaviour from our work if direct evidence for it doesn't exist in the fossil record? I'm not sure we should. We know a lot of adult ceratopsians in bone beds, but few (if not at all) juveniles are recovered in these bonebeds. We also know that most of the known dinosaurs had a social system with juvenile and reproductive adults that lived in distinct associations: these facts support the hypothesis that juvenile and adult ceratopsid did not live together... so, the evidence actually reject the defensive ring hypothesis. Why should I follow an hypothesis that not only lacks evidence, but is also rejected by the known evidence? We should exclude those hypotheses based exclusively on our desires. In a strictly scientific context, any illustrations should be based on the available evidence and that's unarguable, end of story. However, there is still scope for speculation within paleoart. If evidence points towards (for instance - I am wary about getting hung up on one example) adult and juvenile dinosaurs living apart then it would seem sensible to include that in reconstructions. I'm not talking about wild flights of fantasy here, but informed and reasoned attempts to depict possible behaviours and/or situations that may occur. There is so much we don't know surely some speculation is inevitable? We're a long way from knowing it all. But my post was about more than that, because as an artist and (very) amateur palaeontologist I'm interested in the unknowable side of an animal, the feelings seeing these beasts in the wild might invoke and the idea of what would be like to be in their presence, to experience their ferocity and rawness, their grandeur and wonder. To try to communicate their essential nature as we understand it as artists and scientists but in a more abstract, immediate way. This is flight of fantasy in a respect but it could also be an honest attempt to communicate more about what these animals were like as living, breathing creatures. I still think they should be accurate (that the theropod in the image at the top of the post wasn't bothered me, remember) but perhaps what I'm rather clumsily arguing for is should we look outside the conventional styles of paleoart and venture into new territory? Would this still be paleoart? People out there will be doing this already I'm sure. I agree that there are many areas of paleontology that are almost unknown. But I fear that this fact is often used as an "escamotage" for allowing every kind of flight of fantasy to be considered as "paleoart". In my honest opinion, not all forms of paleo-inspired fantasy art could be called paleoart. Andrea- Sorry I do have say your misrepresenting the findings of the Ceratopsian bonebeds. I am a little defensive of them admittedly having been to Centrosaurus bonebed 43 at DPP in person. I think you over state our certainty of the nature of Centrosaurine social groups. Taphonomic studies have clearly demonstrated with these bonebeds there are preservational biases towards larger animals (aka adults). More to the point the Pincher Creek Pachyrhinosaur bonebed has yield incredible juvie material (to the point it has the most complete known Centrosaurine osteologic series), and shows that very young animals were in that group when it was wiped out. I say create a counter piece of art to any memes or myths you dislike (actually funny enough I am in the midst of creating the anti- Ceratopsian circle right now... https://picasaweb.google.com/lh/photo/1JIEHdzoKfvs6GQdDDJki6WNgJNryJ_2lmQ-1h8g0pQ?feat=blogger... as a total unrelated coincidence. You'll note I started this piece nearly two months ago). We have plenty of eager people on ART Evolved that would love you to help dispell (or at least counter) palaeo-art memes!